Well, here we go - my first attempt at a blog. It's the first day of the new year (2012). It's my sixtieth year. I'm going to use this blog as a journal to keep tabs on my book-reading, music-listening, and film-watching during the year ahead. I have lots of books, as always, on my to-read list. And many films that I plan to get to eventually. Today I began a recently-released biography of Charles Dickens - it's called Charles Dickens: A Life, written by Claire Tomalin. I heard her interviewed on a CBC podcast and a BBC podcast talking about the book. It's not the first book I've read about Dickens. And probably not the last (I still have the huge Peter Ackroyd biography upstairs on a bookshelf - read a few chapters when I first found it in a second-hand bookstore about five years ago). 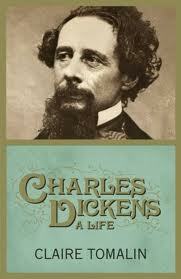 Dickens is a favourite author of mine and I am endlessly fascinated by his life and times - and his novels, of course. A new year, a new resolution and a new adventure in writing! What fun! I shall look forward to your posts! Excellent project, and look at how far you've come! I am subscribing. Thanks for your response! I hope you had the chance to check out some of my Dickens reviews. Tony Grant and I are planning to work together on a Virginia Woolf blog next year. Indeed, you have quite a blog! Too bad you are not on Good Reads.... GREAT social networking site for book lovers.